In the age of digitization, you can’t do without BI as an instrument to run an enterprise. Your enterprise can remain competitive only by systematically generating, analyzing, and using business-centric data/information. Such information is the basis for comprehending how to make operational and strategic decisions. 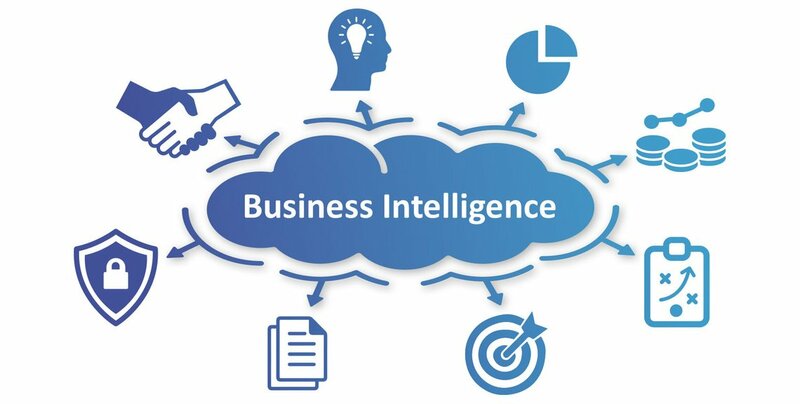 Our consultants at b.telligent have the necessary experience, which makes us your ideal partner to conceive and implement a BI strategy tailored to your enterprise. Your enterprise’s BI systems face new challenges to handle the growing volume of data created by digital transformation. In the past, you have probably seen data silos balloon independently at various locations in your enterprise. Enterprises use diverse reporting programs and their data sources are not uniformly integrated. This results in redundancies in the information, problems in supplying information, poor performance, and high costs – for instance, for maintenance and data management. The technical requirements in the BI market keep soaring, because the highly dynamic markets demand fast reactions and a high degree of flexibility. Moreover, the growing online affinity of customers leads to challenges for customer loyalty instruments. One remedy is to properly consolidate the BI systems and follow a precise approach. 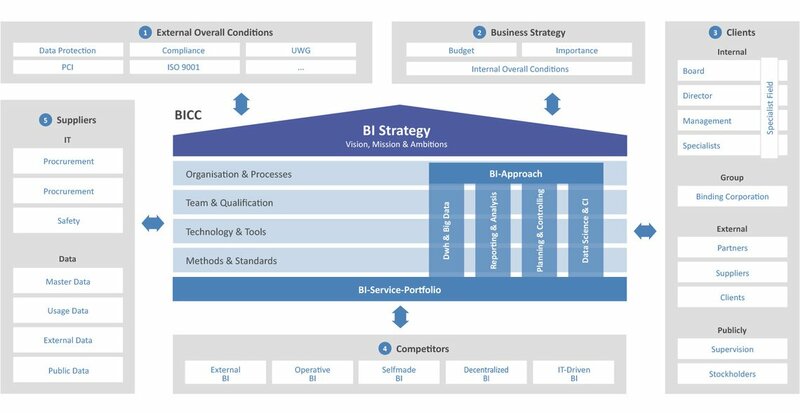 BI must be implemented and considered in both the organization and processes, for which the conception and concrete design of a BI Competence Center (“BICC”) plays a key role. Many BI environments are being consolidated and expanded in the face of greater requirements and expectations of users in the technical departments, and ever-increasing volumes of information. 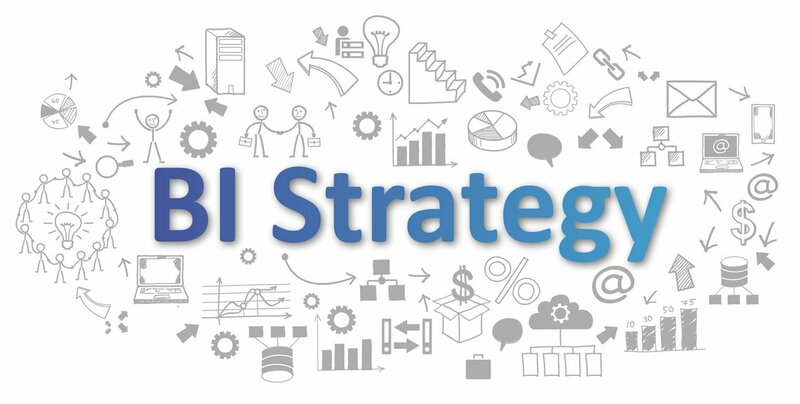 In recent years, we have conducted numerous BI strategy and BI road map projects at b.telligent, which served as the basis for our BI strategy framework. In optimizing and/or introducing a BI system, we initially analyze the aspects listed below. At the same time, we identify the level of maturity of your organization and its BI solutions, and assess these across all sectors. Implementing this framework affects your organizational and strategic business processes – aimed at establishing a consistent BI system across your enterprise and setting up professional and technical standards. The BICC operates as an independent unit that directs measures to optimize processes across the entire enterprise. Another goal of the competence center is to centralize all BI projects, in order to facilitate the communication of best practices throughout the organization. A BICC can be integrated within your enterprise in two ways: as a centralized BICC that sets up its own team charged with executing BI relevant actions. The alternative is a virtual BICC with employees from various departments working in a matrix organization, who handle their own areas of responsibility and organization of the BICC. At b.telligent, we proactively direct the integration process to ensure it is executed successfully. Moreover, a centralized authorization process can be used to grant access to data/information and analyses to a defined circle of decision-makers within your enterprise. Several strategic factors need to be considered during implementation. One: consolidating BI systems can be a highly political issue; hence, it should be accompanied and moderated by an outsider. Two: power struggles arise within an enterprise on the sovereignty of data, in the sense that owners of the information seek to control the information and its analysis to further their personal interests. Three: those concerned raise the issue of whether the software will question existing knowledge or downgrade the expertise of individuals. Four: do external consultants favor particular manufacturers/suppliers? In order to counter such situations, it is necessary to consolidate the BI system by making sure it is futuristic and customized with the aid of modern technologies, sound strategic advice, and concept development by a consultant possessing relevant project experience and expertise. At b.telligent, we identify, execute, and migrate overarching best practices in the areas of methodologies, processes, and technologies to establish a BI system spanning all departments. This approach backs your entire enterprise as it grows and meets its targets. Since we are not tied to any particular technology at b.telligent, we focus our consulting services first of all on preparing and developing a strategy matched to your enterprise. We then assist you in reaching a decision, once we have determined your status quo, identified your needs, and established the requirements for a BI solution. Is an enterprise solution the best way to go? Could a niche system, or possibly a self-developed program best meet your requirements? After you make your decision, we support and guide you on the integration, set up, and execution of your BI strategy – while giving due consideration to IT governance and data privacy rules and regulations.